Sometimes all you need to kick off the day with a huge smile is a bunch of funny images! The easiest way to have some fun is to check out some amusing images online. This is a fairly easy thing to do, considering that the internet is full off photos. However, we decided to make things even easier for you by compiling some pictures in the list you are about to see. It contains hilarious and awkward images that are guaranteed to amuse you and improve your mood. Check out the list and enjoy it! The unintended pun with the words ‘commuter’ and ‘computer’ is absolutely unintended, but it would be the best caption for this photo. 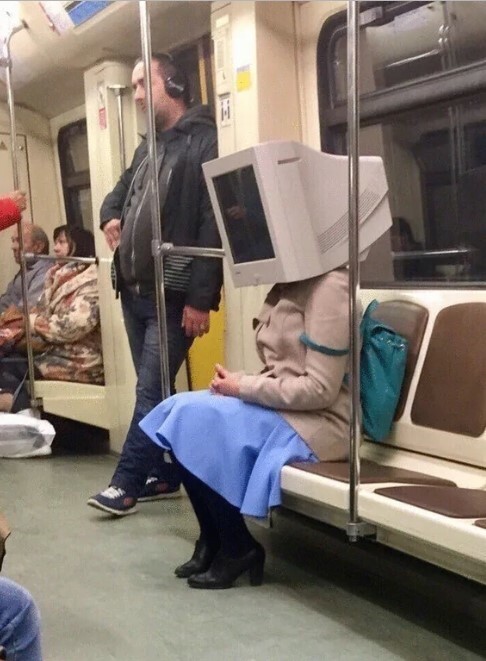 As you can see, a woman on the subway is wearing a huge monitor as a helmet! The reasons for this remain unknown, but it raises a whole lot of questions. First of all, we would like to know how heavy this thing actually is. We guess that she gutted the inside and left only the shell, but it would still be heavier than a hat. 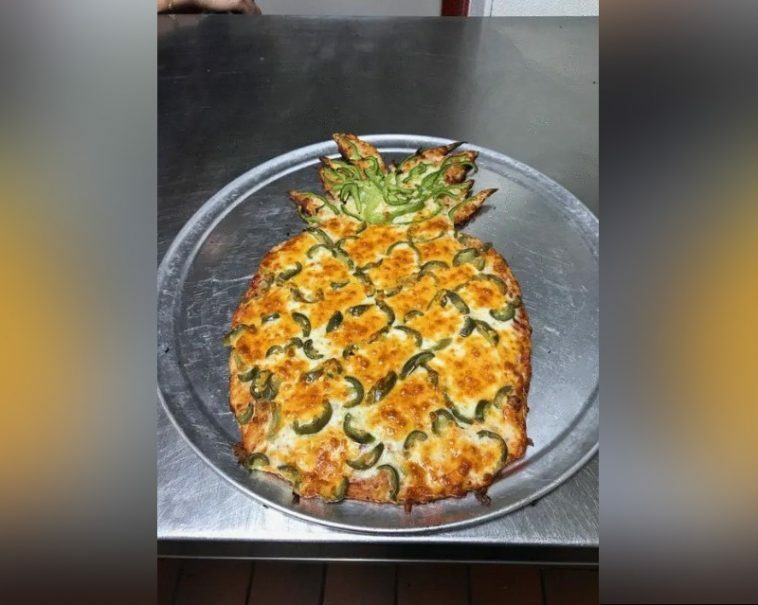 It is definitely one of the weirdest things we have seen. Most people would make a huge effort if they need to throw a party. We imagine a real party would need a real DJ and the proper equipment and speakers needed. 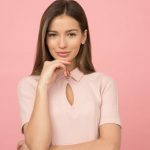 However, sometimes these things might not be enough if you want something truly unique. This is where this guy steps in! 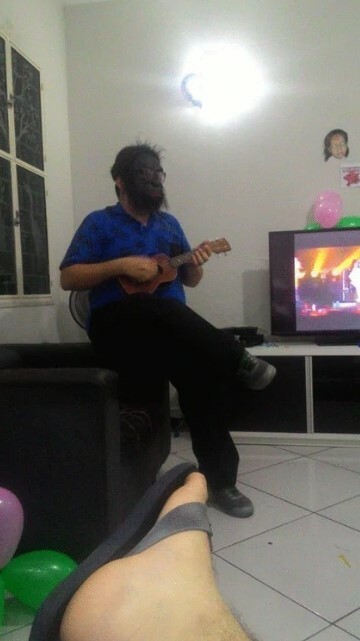 Just imagine having someone playing the ukulele while wearing a gorilla mask! Suppose that the person was actually good at playing too! This is what we call a unique performance. When you go to the cinema, you cannot just walk past the popcorn booth. Despite the ridiculously high prices these places have, you just have to grab a soda and some snacks. Of course, most people try to sneak inside while carrying hidden food and beverages. We have to admit that we do it almost every time. However, the girl in this photo must have a friend working at the movies! 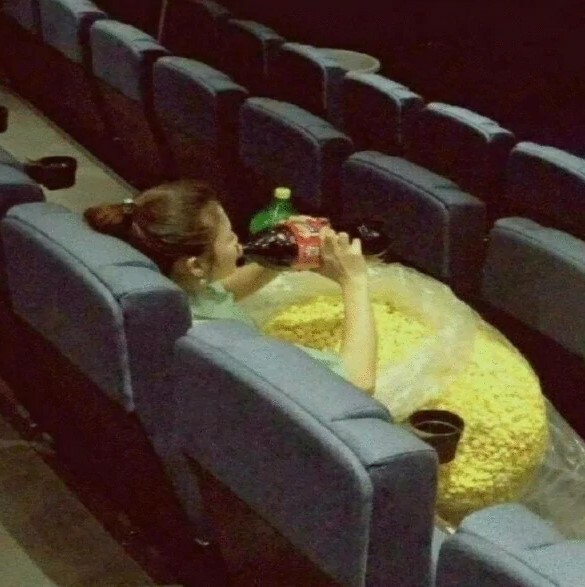 There is no way that anyone could bring that amount of popcorn inside without someone noticing! She has plenty of beverages, too. Innovation is king nowadays, and you can see new things in different aspects of life on a daily basis. However, some people are just experimenting, and we guess this the route to new discoveries. 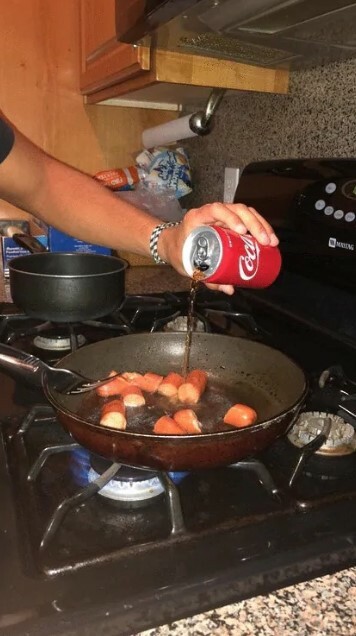 Unfortunately, we guess that cooking hotdogs with soda instead of oil is not something that would be considered as a breakthrough or an innovation. Of course, we are curious to try these, but we guess that we will regret it. We guess that this was nothing more than a joke. 5. 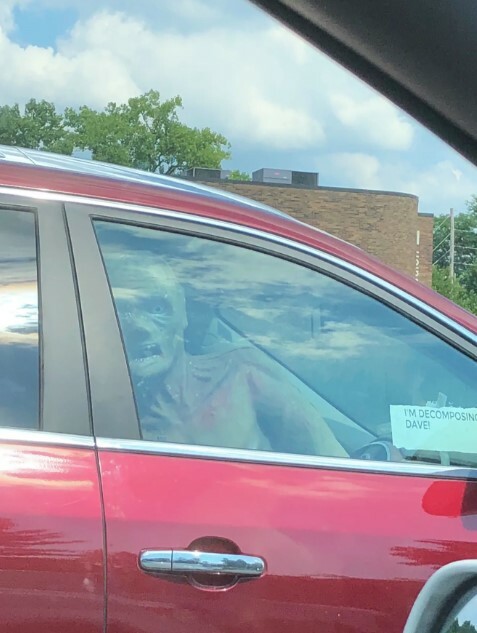 Do you think that there were complaints about this Uber driver? This photo confused us quite a bit. We cannot believe that Uber vehicles without air conditioning exist at all! There must be a list of requirements that all vehicles must comply to! 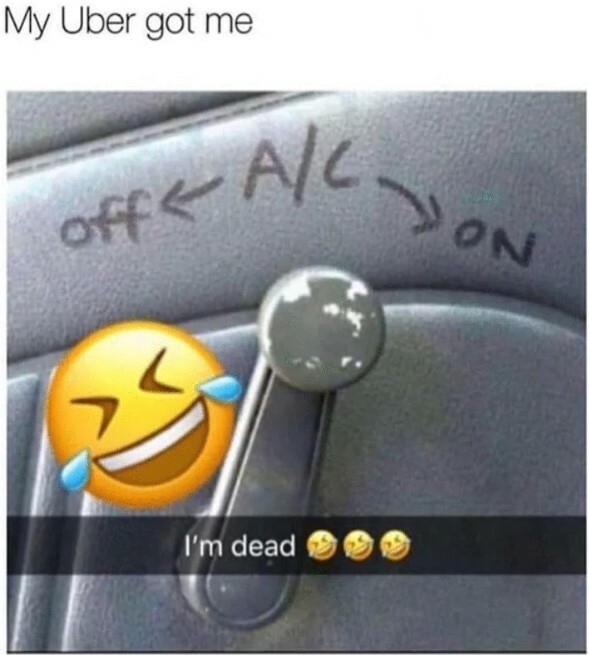 We guess that it might be in a country where cars without A/C or power windows are something common. Even if the whole thing was a joke and the car was not part of the Uber fleet, we still find it to be extremely funny. The ridiculous instructions on the window lever are more than funny. 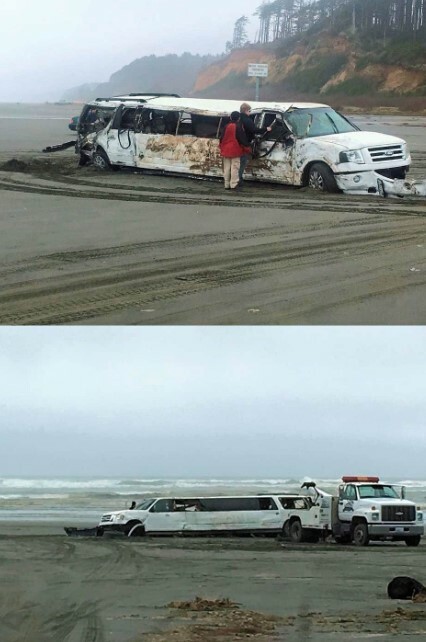 Here is the most unusual wreck we have ever seen stranded on a beach! It looks like it was crashed, burned and probably dragged around by the waves! We have no idea what happened to this vehicle, but we hope nobody got hurt in the process! It looks totaled, but someone might decide to repair it. If this is the aftermath of some party, it must have been the wildest one ever! People can do a lot of gross things, and thankfully they do them in their own homes. However, some folks feel comfortable to demonstrate their weirdness in public. We guess that sometimes they do it without thinking if someone is around or not. People often get carried away, and we can relate to that. 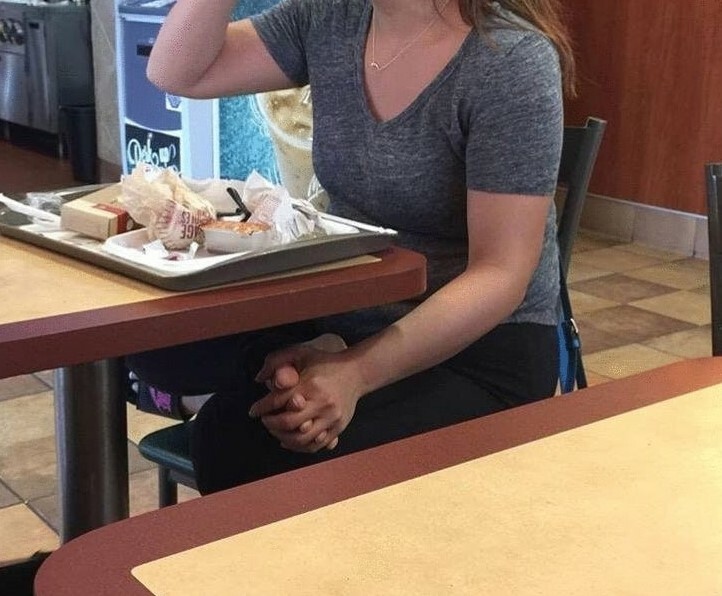 Of course, one thing that we could never relate to is touching our feet while eating at McDonald’s! This does not seem hygienic, and it probably isn’t! 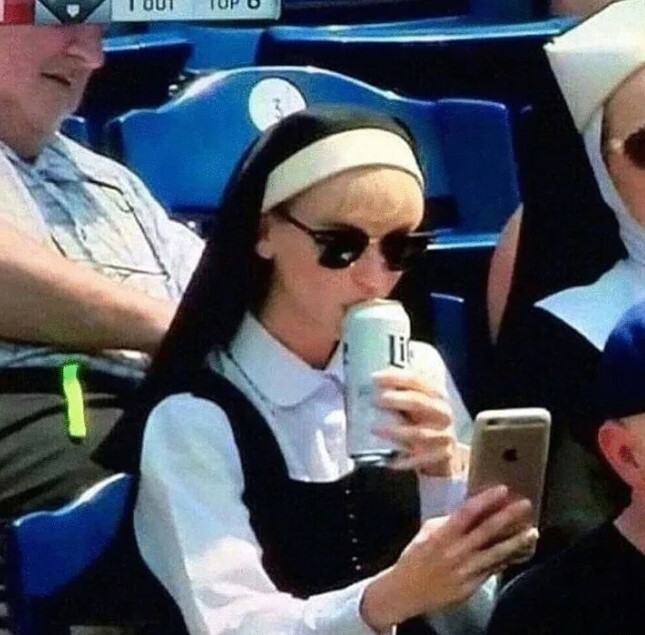 We are not sure if a nun is allowed to have a beer, but we think that everyone must enjoy a cold beverage on a hot day! We also think that everyone should have the opportunity to have fun in every possible way, as long as it is legal. This person couldn’t wait to take a sip and she immediately took a selfie, and there is nothing wrong with that. It is interesting to see all of this in combination with that outfit. Well, we need to point out that the cat does not seem to enjoy any of this! Just look at that dull facial expression! We even think that the cat is annoyed by this kind of games. However, this person seems to enjoy this Batman tribute! We also find it to be hilarious and creative. 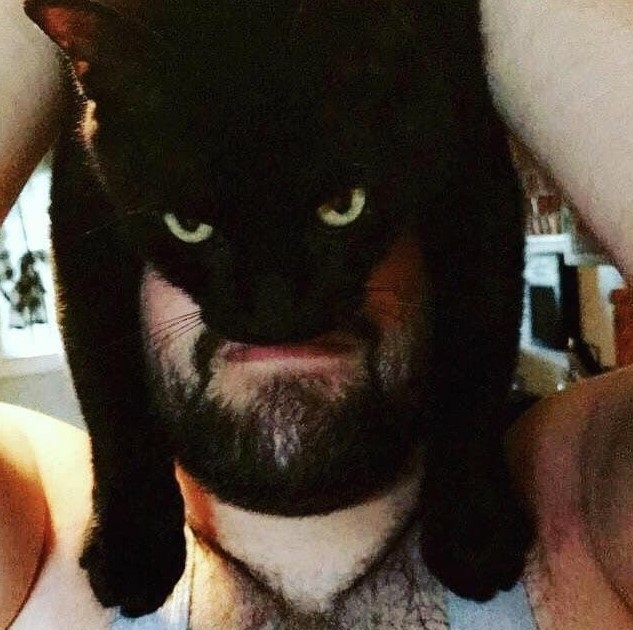 The idea to use the cat as half of the mask is very nice, and the end result is amusing! This bar has the weirdest sign! As you can see, the sign only points out the obvious – it is on the ground. 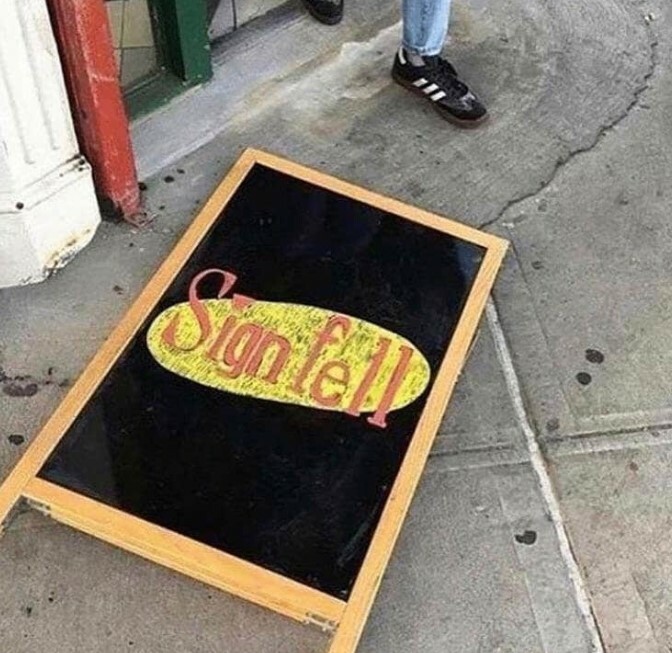 What probably happened here is that the sign was constantly falling to the ground, so the staff was fed up with it. In search of a solution, they probably realized that they should turn the defect into an effect! They wrote the message you see here, so not the sign is probably constantly sitting the way we see it in the photo! It is a nice marketing approach, too. Being stuck in traffic is something that we all hate, so we constantly try to amuse ourselves. There are numerous ways to do that, but most of them are related to browsing online. However there are ways to have fun that do not require any kind of gadgets! One of them is joking with others. As you can see, this person found the perfect way to amuse the other people who are fighting traffic jams. Some folks might be scared upon seeing this fake corpse, but we are sure that everyone laughs afterwards. Well, having this one on the list is definitely a must! When we saw the photo, we were really puzzled! A large group of adults gathered in a room, with half of them walking on all fours, is a strange thing to see! 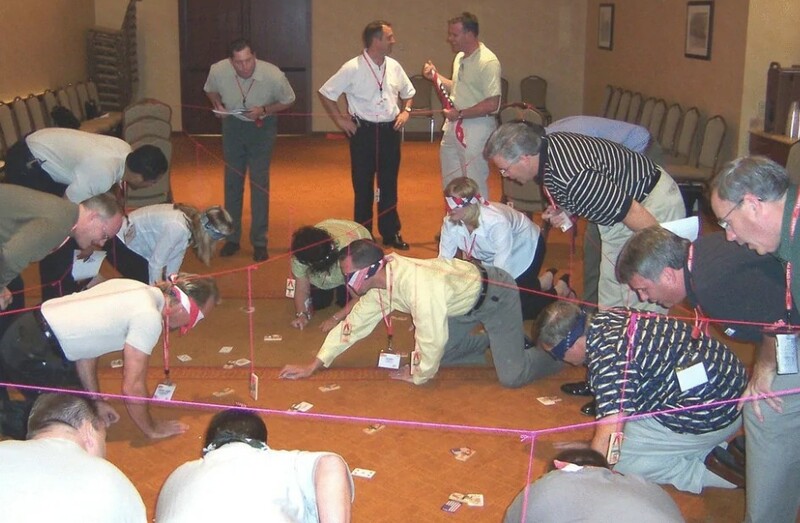 Not to mention that those who are crawling around are blindfolded and there are numerous mousetraps around them. Apparently the others are navigating them through the mousetrap minefield. We guess that the prize for the winner is worth it, because the whole thing is rather humiliating. We have seen a lot of weird image, but this one is definitely one of the hardest to explain. 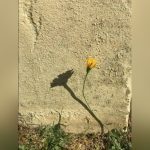 We guess that this person tried to recreate a scene from the original comics. 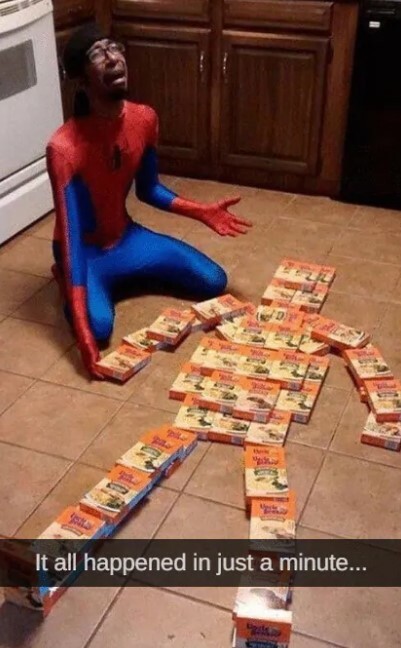 However, we cannot understand what Uncle Ben’s rice has in common with Spiderman! We guess that the whole thing was an attempt to show an episode of Spiderman’s rough past, but they lampooned it. If this is the case, then we totally approve it! Just imagine of signs like this one were put to warn people about wild animals. Nobody would be afraid of them if people keep putting their babies’ faces and taking photos! 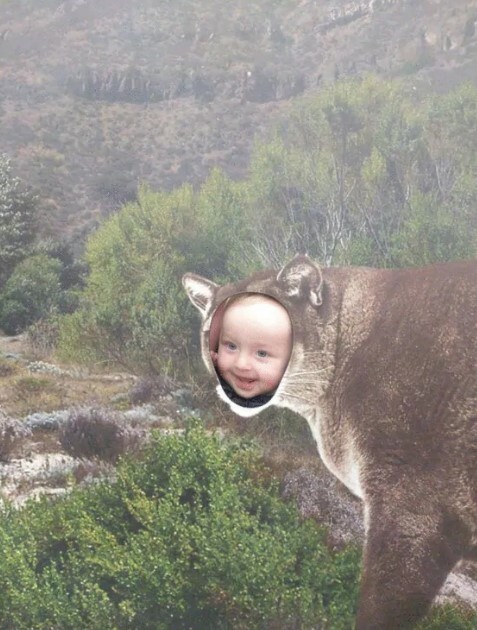 This sign was probably an attraction at a wildlife park, and someone decided that it was a good idea to put the baby there. The cute little human seems to enjoy the whole thing! Just take a look at that smile! Some dogs are not just smart and loyal! They are also way cooler than someone might think is possible. 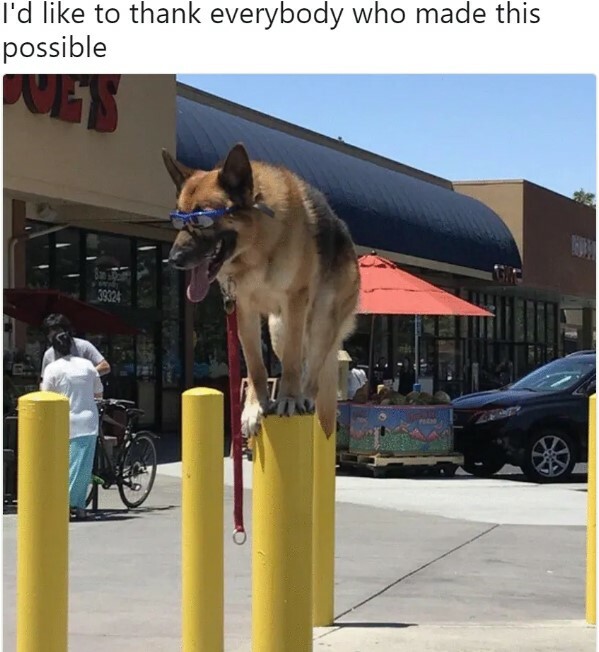 This German shepherd is the best example! Just look at the beautiful, standing on top of those poles. The sunglasses really contribute to the whole scene, and we love that cheeky smile! This dog knows exactly how good it looks and it is not afraid to show it to everyone!